October | 2014 | Loch Lomond Livestock Ltd. Here is a post that I wrote in early October but didn’t post! The last 10 days have been a bit of a blur. After bringing the sheep into the yard, I spent a long hot Thursday weaning and weighing lambs. I also sorted out the cull ewes (ewes that for one reason or another are done producing lambs and now will be sold for meat). The lambs look really great and weights were better than expected, even if it did take me until after dark to get through them all! 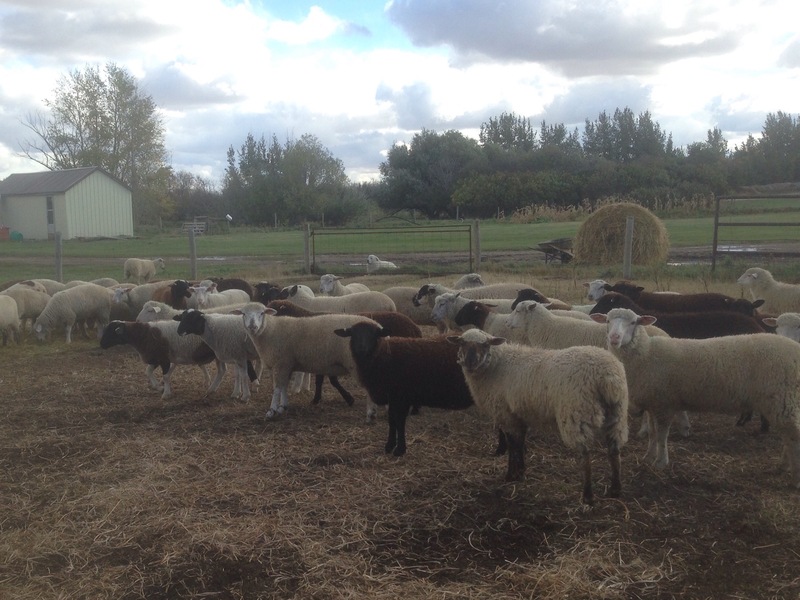 I also had to pick my replacement ewe lambs, and was aiming for 50 but after first cut had 110 or more in the pen. It is a nice problem to have, and after looking at the genetics and weights, I selected just over 70 to keep as breeding stock. Friday we brought the ewes back in to run through the chute and vaccinate because we are participating in a vaccine trial with the WCVM. It was another warm day but went well, and some eager vet students did most of the work! Saturday was a bit slower, but I did manage to weigh through the cull ewes and deworm them so they were ready to get on the truck. As we had already secured a buyer for lambs, Sunday we brought the lambs back into the handling system and vaccinated and dewormed all of them, as well as sorting the group for sale from the lambs that will stay here to get a little bigger. The truck was supposed to come for the lambs and cull ewes on Monday but a breakdown delayed the pickup until Thursday. In the meantime the lambs going to the feedlot had a little more chance to get accustomed to living in a lot and eating hay, so they looked pretty good getting on the truck. Selling direct to a buyer means that we can eliminate commission and trucking costs, and it also is great to build a relationship with the people who end up with our animals. This way they know they are getting good quality animals, and we can ensure a good price for our lambs. It is a nice sense of pride that we feel when we can see our hard work paying off with a nice group of healthy sheep and strong prices to support what we love to do.